The WCOWMA – BC hosted a Site & Soils Evaluation Field Day in the Nanaimo Region (Cedar, BC) on Sunday, March 17, 2019. 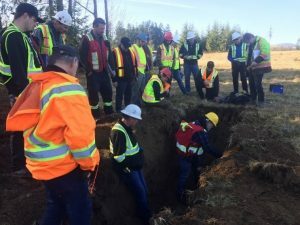 This practical training day was a great opportunity to get hands-on experience evaluating a site, as well as practicing hand texturing and sampling. Kent Watson led a full class of participants in the process of identifying and logging soils characteristics. Steve Carballeira and Garth Millan assisted with the class. WCOWMA-BC would like to thank member Darryl Saam for the donation of the site and equipment. WCOWMA-BC relies on the generosity of its members to provide accessible sites for field training opportunities such as this one.